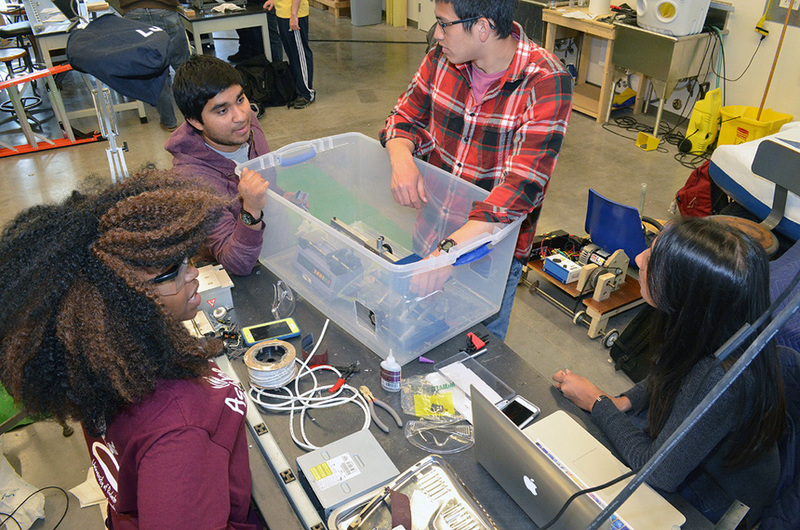 From left to right, Cleopatra Saira, Victor Montano, Christopher Dawson and Allesha Seenauth of Mechanical Engineering work on their senior design project in the Fab Studio at Rettner Hall. 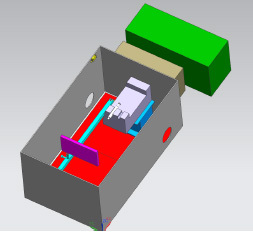 Many of the capstone projects that Hajim School engineering students completed this year could have applications not only here but abroad – for example, more efficient cooking stoves in Kenya, and a compact device to spin scaffolds of cassava starch for tissue engineering in Ghana. Others could have an impact right on campus – for example, the new computer and writing desks that students designed that could be fitted together as workstations in Rettner Hall. Or a new valve one team designed to regulate helium used in fusion reaction experiments at the University’s Laboratory for Laser Energetics. 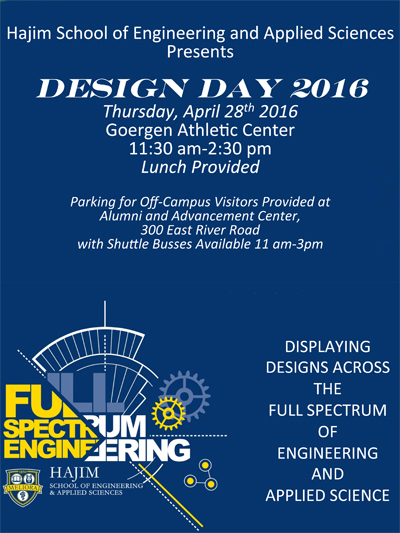 They are among more than 70 projects that seniors in five engineering departments and the Department of Computer Science -- as well as students in the Medical Technology & Innovation Masters Degree Program -- showcased with posters and prototypes on April 28 at the annual Design Day of the Hajim School of Engineering and Applied Sciences. Design Day itself gives students a chance to hone their communications skills as they explain their projects to visitors. Each Wednesday, Christopher Dawson, Victor Montano, Cleopatra Saira and Allesha Seenauth of Mechanical Engineering went on Skype to give a progress report to Elsie Kaufmann, Senior Lecturer and Head of the Department of Biomedical Engineering at the University of Ghana. Kaufmann, who is interested in tissue engineering, asked the team to come up with a way to convert the starch of cassava root, which is commonly found in Kenya, into submicron fibers that could serve as scaffolds – or temporary supports – for cell attachment and tissue growth. The collaboration grew out of a visit by a delegation of University of Rochester faculty members and administrators to the University of Ghana last year. The delegation included Prof. Paul Funkenbusch of Mechanical Engineering, who helped to supervise this project. Seenauth said this was her first opportunity to pursue her interest in nanoscale research. As part of the project, team members examined the fibers they produce with an electron microscope. 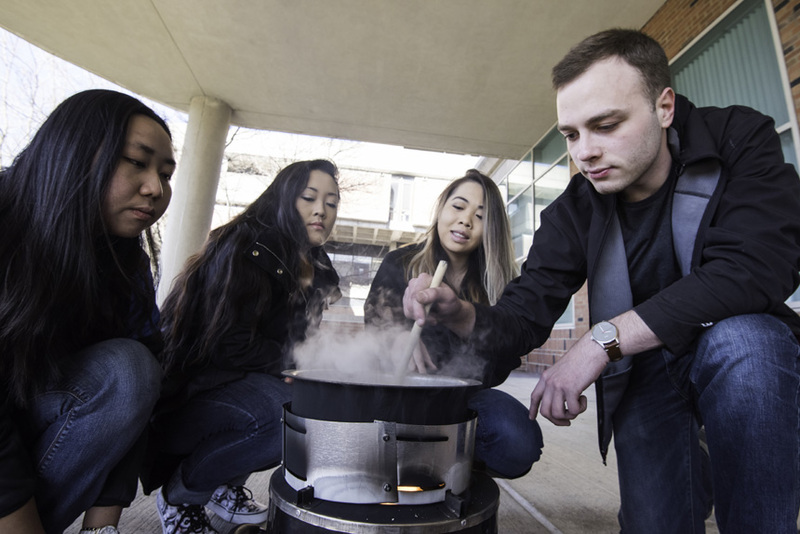 Seniors Jessica He, YeJin Jeong, Adam Langenbucher, and Nikki Sroka of Biomedical Engineering developed an adjustable “skirt” to fit around any size pot used atop the portable cooking stoves that the BURN company produces in Kenya. The stoves consist of a combustion chamber for burning wood or charcoal. The skirts help concentrate the rising heat immediately around the walls of the cooking pot sitting on top of the chamber. This increases fuel efficiency, meaning families have to spend less time or money cutting or buying fuel, which lessens deforestation. It also means less time spent standing over the stove, reducing exposure to emissions. The skirts currently come in fixed sizes. “Research has shown there is an ideal distance between the skirt and the wall of the pot at which efficiency is highest, and that’s about 10 mm,” Sroka explained --hence the need for a skirt that could be adjusted to that ideal distance with any of several different sized pots a family might have in it’s possession. “It would be cost effective and make life so much easier,” Sroka said. The project originated when BME alumnus Boston Nyer ’08, General Manager and Co-founder of BURN Manufacturing Co., came to the Hajim School last fall to give a talk. Working with Paul Means, Research and Testing Manager at BURN, the team developed an aluminum prototype that was on display during Design Day.